Beading tutorials can give you the confidence you need to begin creating your own handmade jewelry. Crimping is an important skill to have when designing your own handmade jewelry. Crimping tubes are used to secure the end of beading wire to a clasp or connector. This technique can be tricky to master, so be prepared to spend some time practicing. 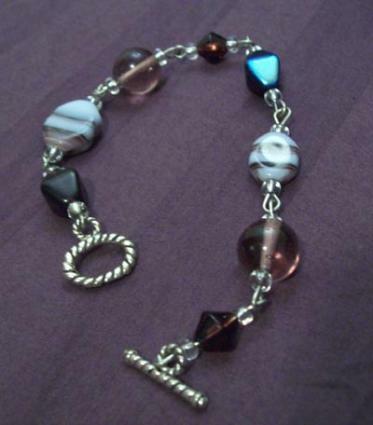 Add a crimp tube to your strand of beads. Pass the beading wire back through the crimp tube and one or two beads on the strand of your bracelet or necklace. Pass the beading wire through the clasp or connector. Pull the crimp tube and beads next to the closure. Use the first notch on your crimping pliers to squeeze the tube shut, making sure there is one wire on each side of the crimp. Use the second notch on your crimping pliers (the one that is rounded on both jaws) to gently squeeze the tube back into a cylinder. Trim the tail wire as close to the beads as possible. Thread your focal point bead on a large headpin. Grasp the top of the pin with round-nose pliers. Holding onto the wire with one hand, use your pliers to bend the pin until the wire and end and stem touch. The resulting loop should look somewhat like the letter P.
Hold onto the loop with round nose pliers, the use flat nose pliers to make a 90 degree reverse bend at the spot where the loop ends. Attach your pendant to your necklace with a jump ring. Jump rings are small round wire circles that are used to attach pendants and charms to your beaded jewelry. Although some crafters choose to make their own jump rings, these findings are very inexpensive to purchase and generally available wherever beading supplies are sold. Place a pair of flat-nose pliers in each hand. Grasp either side of the ring with the pliers, making sure the split part is in the center. Move one hand away from you while you move the other hand toward you to open the ring. Closing the ring follows the same basic procedure, except you're pushing in the opposite direction. Additionally, you may be able to hear the ring make a small "snapping" sound as the two sides connect. Fire Mountain Gems, one of the Web's best sites for buying jewelry making supplies, also has a large section of instructional information for crafters interested in improving their beading skills. Beadaholique has a number of tutorials, as well as project bundles that make it easy to get started. Around the Beading Table has several sample projects that illustrate important jewelry making techniques.